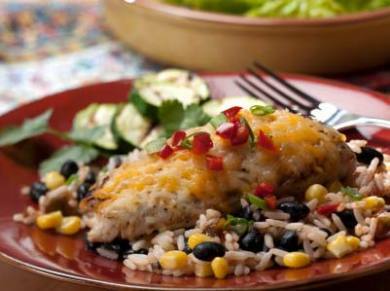 Quick salsa chicken and rice recipe for a hearty, filling meal in a hurry. Heat oil in a large, deep frying pan or skillet. Add chicken and garlic, stirring occasionally, until chicken is no longer pink. Add rice, water, and chicken bouillon cubes, and tomatoes and bring mixture to a boil. Cook for 12 to 15 minutes longer, allowing liquid to be absorbed and rice to become tender. Toss with chopped green onions and serve at once.